WASHINGTON, March 22, 2018 /Christian Newswire/ -- ChinaAid and its supporters will celebrate the life of the heroic Chinese human rights lawyer Li Baiguang today in Washington, D.C. Dr. Li strove tirelessly to ensure that all China's citizens enjoy equal human rights and religious freedom, paving the way for justice and democracy in a land held in the chokehold of the Chinese Communist Party. Dr. Li began defending victims of human rights abuses, such as impoverished farmers, in March 2001, for which he was detained on Dec. 14, 2004. He continued his work after his release on Jan. 21, 2005, and a Beijing church baptized him as a Christian later that year. In May 2006, Li traveled to the U.S. capitol with a ChinaAid delegation, meeting with several prominent U.S. officials, including President George W. Bush. Two years later, Li returned to D.C., meeting with Bush once more and visiting the National Endowment for Democracy (NED) to receive their 2008 Democracy Award. 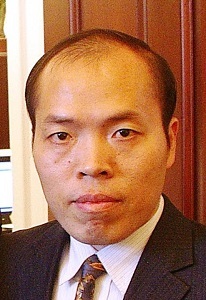 After relocating to Nanjing, Li began to take on more cases, defending some of his fellow persecuted human rights lawyers and members of China's house church. Months before his death, he was dragged into a forest in Zhejiang province and beaten by his kidnappers, who threatened to kill him if he didn't leave the area by 10 a.m. the next day. After he reported the case to the police, he received anonymous death threats. Nevertheless, Li never wavered in his decision to fight Communist Party abuses. In February 2018, he traveled to D.C. with ChinaAid one last time and met with many U.S. officials. Despite the extensive risk to his safety, Li chose to return to China and continue his work. On Feb. 25, he went to see a doctor at Nanjing's No. 8 Military Hospital for stomach pains, within a few hours, physicians mysteriously declared him dead and alleged that his liver had failed, even though he had no previously known medical concerns. In order to honor Dr. Li's life and tireless legacy, a group of his friends and supporters will gather for a memorial service at Christ Our Shepherd Church in Washington, D.C. at 12:30 p.m. today. Attendees will hear from a myriad of prominent figures who supported Li's work, including former Congressman Frank Wolf, NED President Dr. Carl Gershman, ChinaAid President Bob Fu, the Congressional-Executive Commission on China's Director of Policy and Media Relations Scott Flipse, former Permanent Representative to the United Nations for World Evangelical Alliance Deborah Fikes, as well as many others. "Dr. Li was similarly honored by the prestigious National Endowment for Democracy with their 2008 Democracy Award for his heroic efforts to advance democratic values and fundamental freedoms. "My staff met with him when he was in Washington this February to attend the National Prayer Breakfast, mere weeks before his sudden and unexpected death in a Chinese military hospital. Throughout his life he was no stranger to harassment and persecution at the hands of his own government. His defense of farmers, petitioners and Christians—the very work that earned him accolades in the West—made him an enemy of the Chinese government and Communist Party. "He was a signatory of Charter 08, an open statement calling for political reform and greater protection of human rights in China, which was released on December 10, 2008, to coincide with the 60th anniversary of the Universal Declaration of Human Rights and Human Rights Day. The current bleak trajectory for human rights in China, in particular the targeting of China's rights lawyers who are at the vanguard of pressing for rule of law and basic freedoms, is a stark reminder of the unrealized aspirations articulated in Charter 08. "As you gather today to honor the life, work and legacy of Dr. Li and to stand in solidarity with others like him who pursue justice on behalf of the marginalized, persecuted and oppressed in China, we can take comfort in the knowledge that this courageous and principled man of faith has no doubt heard the words we all long to hear, 'Well done, my good and faithful servant.'" ChinaAid is deeply saddened by Li's passing and hopes that his life will inspire others to take up the torch of tirelessly pursuing human rights and religious freedom for all. To commemorate Dr. Li, ChinaAid named their legal defense fund the Li Baiguang Religious Freedom Defense Fund, which will raise money to support those who continue in his footsteps.